What is the difference between firmware files? - DrayTek Corp.
What is the difference between firmware files? Different Annex Type and Modem Codes? For most models, there are two files with the same file name but different extension: 'all' and 'rst'. They are actually almost the same, only that upgrade with the RST file will reset the router to factory default while the ALL file will keep the current configuration. It is recommended to use the RST file when you are trying to recover your router from a damaged firmware, having a big change in firmware versions, or downgrading the firmware to an earlier version. You may find there is ".ota" firmware file for some of the models on our FTP server. This .ota file is for the model which support auto firmware upgrade, router will get the latest firmware file from our FTP server and upgrade itself automatically. Please use .all or .rst file for manual upgrade, do not use .ota file to upgrade your router. 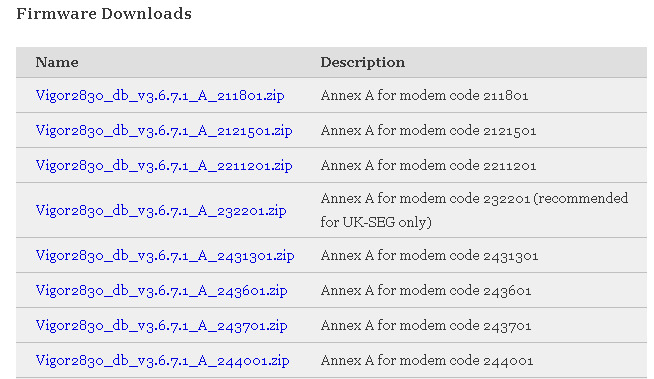 For DSL models, we offer different modem codes version to meet different ISP's need. For most area, usually the STD (Standard) version would work. But if it does not work as expected, please contact our local support, they will help you find the right modem code. As for Annex type, it is a hardware difference of the routers. Please select the type according to your router's Annex Type. You could check this information bytelnet into your router, and enter the command "sys ver". For DSL models, there will be two folders: STD and VECTOR. The files in VECTOR folder implement a new DSL driver, which supports G.Vectoring on VDSL. If you're using a VDSL line, VECTOR firmware may brings out better performance; however, please consult your ISP to check if G.Vectoring is required. We also provide two versions of Vector firmware to avoid the interoperability issue. You could just try the other one if the one you use cannot synchronize or get the speed that you expected. For Vigor2910 series, there will be v2910 and v2910c files in the folder. The 'c' of v2910c stands for China, and we have a model "Vigor 2910c" especially for China. Please just use the firmware file according to your router's model name. 45What is the difference between firmware files? has been viewed------ 45 ------times.